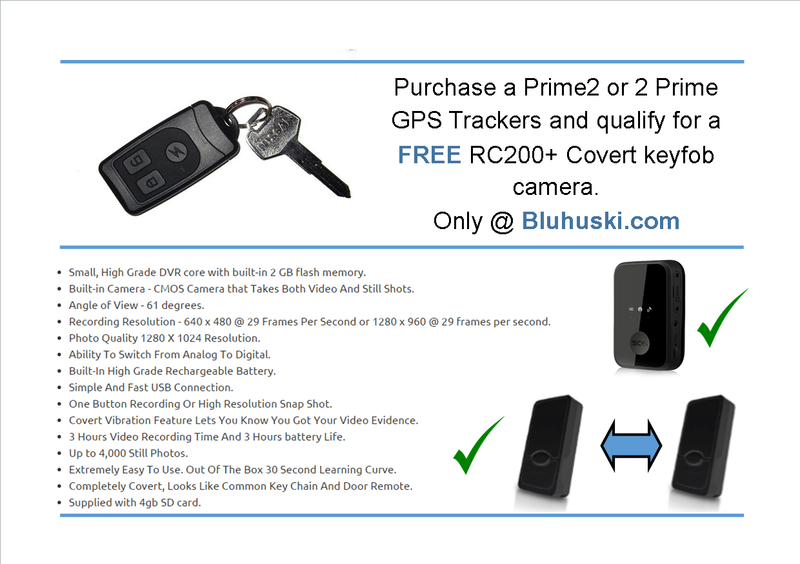 All GPS Tracking Devices supplied by Bluhuski Covert Technology Ltd (Bluhuski) are supplied on the understanding that data is provided with no warranties, or guarantees, expressed or implied, concerning data accuracy, completeness, reliability or suitability. Bluhuski shall not be held responsible, or be liable regardless of the cause or duration, for any errors, inaccuracies, omissions or other defects in or anomalies or the untimeliness or un-authenticity of the data or for any delay or interruption in the transmission thereof to the user or for any claims or losses arising therefrom or occasioned thereby. The end user assumes and accepts the entire risk as to the quality, and quantity of the data. This applies to any Tracking Device and Tracking Panel that is in use as it must be understood and accepted that GPS devices and data can be affected by influences beyond the control of Bluhuski such as weather, topography, position and installation point. Also Bluhuski cannot be held responsible and accept no liability if there is any kind of “Outage”, breakdown, loss of signal that is connected to any land or mobile telephone company or provider and the same applies to satellites and their controllers. These Terms and Conditions only apply to sales of items made directly between Bluhuski Covert Technology Ltd (Bluhuski) and the end user. By placing an order with us it is assumed you have read, accepted and agreed to be bound by these terms unless agreed otherwise in writing. The purchaser of any devices or credits from Bluhuski Covert Technology Ltd has the responsibility to comply with the law and it is their sole responsibility to educate themselves accordingly. Under NO circumstances shall Bluhuski be held liable or responsible for any direct, indirect, special, consequential or incidental damages resulting from the inability to use, misuse, or use any product purchased from Bluhuski. By submitting and order, the purchaser represents, and accepts, they he or she will use the device acquired in a responsible and lawful manner and that they will not violate an individuals rights. These conditions are in place of and exclude all other representations, warranties and conditions except as implied by statute and in particular the purchaser acknowledges that he has relied solely upon his own inspection and skill and judgement and not by reason of any representation by the company. In the absence of a written order from the purchaser, the company’s internal order will constitute the basis of the agreement. Unless expressly accepted in writing by the company any variations of or additions to these conditions in a purchaser’s order or order form will be deemed to be inapplicable. We may, from time to time, change some or all of the terms of this Agreement. The terms which will apply to you are those which appear on our website on the date which you order from us (your ‘order’). It is assumed that by placing an order you have read these terms and condition and totally agree with their entirety. You should print out and retain a copy of those terms at the time at which you send us your order. Descriptive and clerical errors are subject to correction. Orders must be placed by the issue of a valid purchase order or other written communication. Bluhuski Ltd reserve the right not to accept any customer order. We will treat your order as an offer to buy and except for retail or mail order sales we will send you an email to confirm receipt of your offer. This e-mail this does not mean that your offer has been accepted. Certain products and offers may only be available to qualifying customers, for example in particular geographical areas. All prices quoted on our site exclude carriage costs which will be added to your order during the checkout process. VAT, where applicable, will be added to the cost of the products at the appropriate rate. Unless explicitly requested, method of carriage will be at our discretion. Any costs omitted or corrections on your invoice will be invoiced / credited later. Please notify us promptly if you are not billed the correct amount and we will correct the error. All advertised/advised/published pricing is subject to change at any time without notice due to market/currency fluctuations and other factors. If a price has changed, we will advise before proceeding with an order if you have specified a different price on your order. All quotations are subject to withdrawal or reasonable variation by the company at any time prior to firm acceptance of an order. No order given to the company based upon a quotation shall be binding upon the company until accepted by the company in writing. The company reserves the right to correct any error or omission or quotation or invoice without prior notice. We accept payment by cash, cheque, postal order, most major credit / debit cards and BACS. We reserve the right not to dispatch goods until funds have cleared. All costs, charges and expenses incurred by us in recovering any debt shall be paid by you. If a payment is made by cheque which is returned unpaid, you shall be liable for all reasonable costs incurred as a result. Standard UK Delivery is normally made within 5 working days but no absolute guarantee can be given of this or any other delivery times. Where a premium service is requested (e.g. next day, AM delivery or Saturday) our liability extends only to a refund of the premium should the delivery not be attempted on time. Same-day dispatch is subject to the order being received earlier than that working day’s ‘cut off’ time but this may vary with workload or around holiday periods which you will be notified at the time of order. “Working day” is considered to be Monday to Friday, excluding holidays or any other day on which our offices are closed. Deliveries may be made any time between 9am and 6pm. Our standard delivery service covers most parts of mainland UK. It is essential that someone will be at the delivery address to receive and sign for the goods. You must inspect goods supplied as soon as practicable after delivery and notify us within a reasonable period of time of delivery any alleged defect or failure to comply with the description of the goods. The goods are at your risk from the time of delivery and no liability will be accepted by us for damage or loss to the products after the time that the delivery document stating that the goods were received has been signed. Failing such notice you will be deemed to have accepted the products and it shall be conclusively presumed that the products are in accordance with the contract and free from any defect or damage, which would be apparent on examination. Our standard UK mainland, EU and International handling & delivery may be subject to change at any time. Bluhuski Covert Technology Ltd warrants to the original purchaser that this product shall be free from significant defects in material and workmanship for 12 months beginning on the date of purchase as shown on your receipt. Should the product need to be returned it must be sent directly back to the original place of purchase to be processed. Proof of purchase must accompany the returned product. If purchased direct from Bluhuski Covert Technology Ltd a returns authorisation number is required prior to the product being returned to Bluhuski Covert Technology Ltd . Product must be returned by signed delivery in suitable protective packaging. This warranty does not apply to any product that has been subject to abuse, misuse, negligence, tampering or has been modified in any way or any device that has been left out of Credits for 3 months or more or has not been operated for 3 months or more and allowed to give a Position Report and update. Without prejudice to your rights Bluhuski Covert Technology Ltd may replace a defective product or issue a credit note against future purchases. No other warranties, express or implied are made. Bluhuski Covert Technology Ltd shall not be liable for any special, incidental or consequential damages whether or not the purpose for which you purchased the product was made known to Bluhuski Covert Technology Ltd, the retailer or otherwise. Your statutory rights are not affected in any way. It is your responsibility to ensure that the correct goods and correct model are ordered for your purposes. In some circumstances, the capability we specify and advertise of the product may not match that of our published specifications elsewhere, often due to international variations. Please, therefore, refer to our site for the specification. This may also apply to specifications listed within any packaging and user guide/manuals supplied which may not apply to your particular product, either due to product development, varying models, specification change or local variations. It is your responsibility to be aware that Unlimited Credits expire on a given date, any unused PAYG Credits will expire 12 months after purchase date. It is your responsibility to ensure that each device is operated at least once every 3 months otherwise the device SIM may be cancelled. The Customer agrees that if their device has not been used for 3 continuous months, or has been out of credits for more than 3 months, the SIM Card may automatically be cancelled, therefore it is crucial that you ensure that the Credit Package you order is the correct package for your needs to be able to comply with the requirede update procedure of activating the device every 3 months so it can report a position and update. Bluhuski Covert Technology Ltd sells their products to the purchaser on the contractual understanding that neither the whole or part of any of the technology which has been developed within any of their products will be used on or incorporated in, whether in total or as part of any other product in the field of RFID or GPS save by agreement by an authorised employee of Bluhuski Covert Technology Ltd and then only as specified by a written agreement or license to do so.